We had a very nice, low-key anniversary. I picked up sushi on the way home, so we had a nice dinner and a relaxing evening. I still can't sleep lying down, so I'm still stuck sleeping in the recliner, but at least I am getting sleep. Not enough to get over this bronchitis, but sleep. I have two more pills to go on the antibiotics and then I supposedly should be cured. I'm not, but it's a LOT better. Tomorrow we have Ren Faire again, and hopefully it won't be too cold and windy. We only have three weekends left and as we go along now, it will be more into autumn and colder. Here's a lovely autumn pic for all of you. 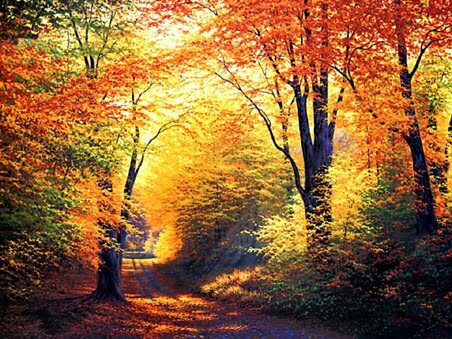 It is my favorite season and I love the colors and promises that autumn brings to us. Wow, what a great photo! I will probably sound like a worried mother now, but perhaps you should stay home instead of going to Ren-Faire. You really must take care of you and not do anything that would make your illness longer. The more obedient patient you are, the sooner you'll get better. I won't stay if it rains, but I am Elvish enough that being outside is always a help to me. I'll dress warmly, our Fests always have a huge range of temperatures over the seven week run, so I'm used to everything from 90+F to 32F with snow. It's a crazy time of the year - anything can happen. And I'm really feeling much better, just not totally recovered which, I suspect, will take most of a month or two to really cure.